A shipping company operates a heterogeneous fleet of ships to service a given number of voyages on a number of trade routes over the planning horizon. Each ship has a predefined speed range within which it can sail. Fuel consumption, and hence fuel cost, significantly depends on the chosen speed. Furthermore, the shipping company makes Contracts of Affreightments with the shippers stating that the voyages on each trade route should be fairly evenly spread. This leads to the maritime fleet deployment problem with speed optimization and voyage separation requirements. We propose two formulations for this problem, i.e. one arc flow and one path flow model. The non-linear relationship for fuel consumption as a function of ship speed is linearized by choosing discrete speed points and linear combinations of these. 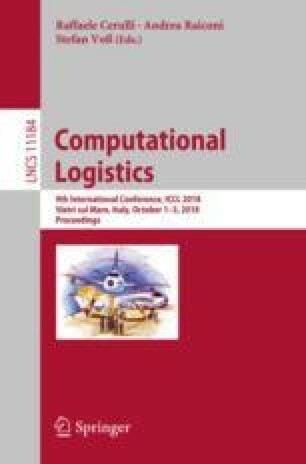 Computational results show that the path flow model performs better than the arc flow model and that incorporating speed decisions in the fleet deployment gives better solutions and more planning flexibility.